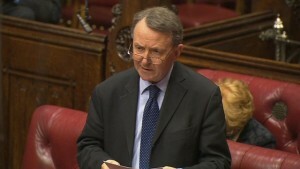 Catholic peer, Lord Alton, has called on the British government to accept the “reality” of the persecution of Christians in Pakistan, as a report launched today finds UK government policy on Pakistani religious minorities to be inadequate. The All Party Parliamentary Group for International Freedom of Religion or Belief, of which Lord Alton is a Vice-Chair, launched its inquiry report in Westminster today. The report on freedom of religion in Pakistan challenges the British Home Office’s Country Information and Guidance about Pakistani Christians and Christian converts, while also finding that Christians, Ahmadis and Hindus in Pakistan face a real risk of persecution. “The official line of the UK Government is that there is no persecution [of religious minorities], the reality is the opposite of that and our report dispenses with that illusion,” Lord Alton said on introducing the report at the House of Lords. “Pakistan is the biggest recipient of British aid – more than £1 billion in the last couple of years – and we should be demanding that British aid is used to protect minorities and to staunch the flow of refugees,” he added.